I woke tired, even after a good nights sleep. The origins of this tiredness lies deep within my being. My soul is crying out “nurture me, stop ignoring me” and I need to start listening to it. Fortunately we have a long (as in 3 day) weekend ahead of us – maybe … I’ll make a start today, but where do I begin? I thought about the long To Do list Lynsey and I had talked about for this weekend (as always the list is longer than can realistically be achieved in the time available to us). It included endless household chores like cleaning, dusting, washing etc. I wondered how doing all these things was going to connect me to my soul and make me feel more alive, more energised. In places and people, we seek that elusive feeling of being welcomed. We want our houses and apartments to be warm and nurturing and beautiful, but they are sometimes territories of chaos and confusion … Yet, the haven the soul seeks is close at hand, within the stove and the cupboard, on the bookshelf, and in the closet. With the eyes to see it, and the hands to create it, we can recover the home that the soul desires. Anthony Lawlor, A Home for the Soul: A Guide for Dwelling with Spirit and Imagination, cited in Breathnach, S.B. (2002). Romancing the Ordinary (p.211-212). London: Pocket Books. So first things first, what am I going to make for lunch (yes, we slept in and missed breakfast – technically I was making brunch). Lynsey headed for the garden and I headed for the kitchen. There is something comforting about the kitchen. It is a room laden with memories, endless sensual experiences and boundless creativity. Our kitchen is the centre of our home, whether it is just us or when we have friends and family around. People congregate in our kitchen (oh how I dream of having an open plan kitchen that melds into our other living spaces without the current walls that separate it off as though it needs to be hidden) – Lynsey and I cook, our guests sit, we have music going, wine and food on hand to whet the appetite – it is nurturing and loving. There is laughter, loads of talking and generally it is a place where everything is right with me and the world. Nothing else matters when I’m in the kitchen except what I’m there to do. Today I created a tantalising mushroom soup (I know what you’re thinking, chicken soup is the soul soup – oh well, today I created a new soul soup that was equally as nourishing and nurturing), tasty baked cheese puffs with avocado, tomatoes, and some wonderful New Zealand cheese to go with them. The smells of the cooking infused the house. As we sat down to eat I felt warm, loved and comforted. I hope my waistline wasn’t too drastically affected by the experience. A meal shared in a welcoming environment definitely soothes a tired soul. 24 Oct This entry was written by Marica, posted on October 24, 2009 at 11:45 pm, filed under eating in, food, home, self care, spirit and tagged kitchens, making time for yourself, nurturing, smells, soul, soul food, tastes. Bookmark the permalink. Follow any comments here with the RSS feed for this post. Post a comment or leave a trackback: Trackback URL. Enjoy 🙂 Ours were delicious as always. They are so easy to make and they never fail. 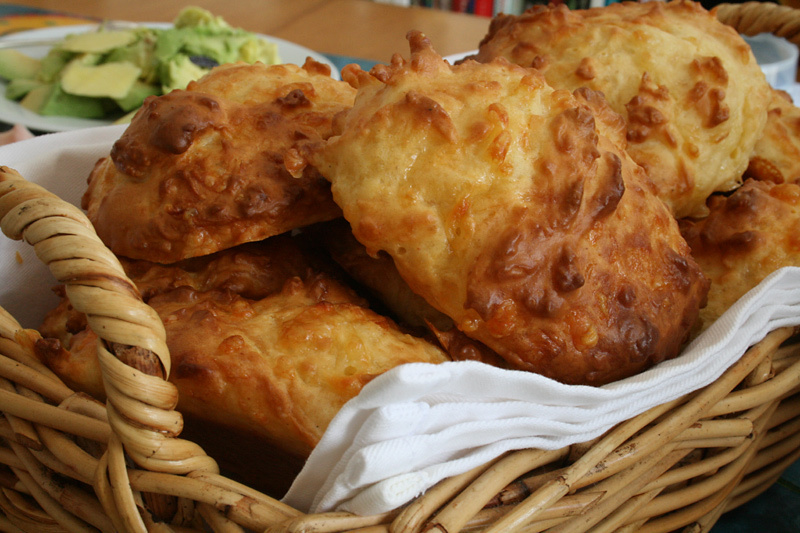 It’s not fair posting a picture of such delicious-looking cheese puffs. They are reaching out through the screen to me…and I want to pick one up and taste the soul!